Thanks!!! The only pilsen I have is the Cherry Burst PI-80. The Orange Burst is a 68, The Padauk isn't a pilsen, just a limited run of 13 from Boogie Street. The two black ones are actually thick body, custom import 66's, also from Boogie Street. The 68 and the 80 are stock pups, Fallen Idol has SD El Diablo's, Padauk has SD Antiquities, Black flame top Elite Idol had ZW EMG's. The 68 is very nice. Thinner body than the PI-80, but very smooth. I am going to change out the bridge pup with a Dimebucker, these guitars scream with Dimebuckers. And the PI-80 will be changed out with a JB, this thick body sings with a JB. I tend to think the tone difference between the two is kind of like an SG and a Les Paul. There are a couple of guys on here, Krazymonkeynuts and Flymolo, they are more knowledgeable on the subject than I am. Let me know if the is anything I can help with. These are mine. A couple aren't Idols but you get the point. 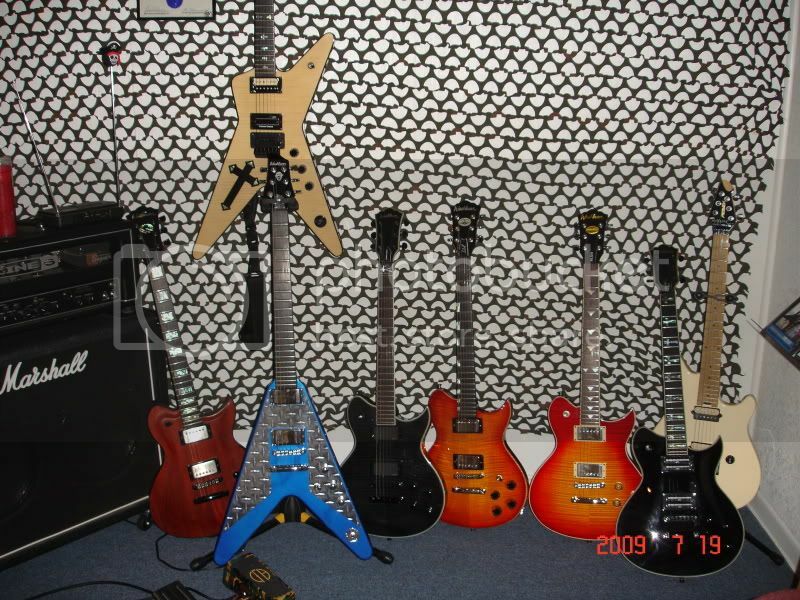 All are from Boogie Street Guitars except the white Peavey. I think it needs to be more rectangular or keep it how it is. The one used now is unique. That is one of the best Slimes I've seen!!!!! That is my favorite Dime fiddle!!!!! If you ever think of getting rid of it, let me know!! You can try boogiestreet or funkymonkey. they both have an e-bay store. Hope this helps!